One could use this system to implement the xover/eq for the Linkwitz Labs Pluto 2.1 or LX521. For those interested, I’ll post specific configuration files in the Owners’ area of the Orion/Pluto/LX521 Forum: together with this how-to, those files can be used to build a DSP version of the Analog Signal Processor (ASP) for those loudspeakers. I’ve written a long article detailing my development of the LX521 implementation; my Pluto implementation is similar. The input can be an analog (line-level) or digital (S/PDIF) feed to a sound card, or else a digital audio file stored on disk and decoded by the PC. The crossover/eq are performed (in real time) in software on the PC, with output (4- or 6-channel, digital or analog) to a multi-channel sound card. In practice a single sound card can handle both inputs and outputs. Volume control can be upstream (in digital) or downstream (analog), depending on how you want to configure things. The PC can also act as a media server, programmed so that all output goes through the crossover/eq. You’ll need a PC equipped with multi-channel audio output. For a stand-alone unit as in the photo above, you’ll want a small, fanless PC (no fan noise) with a solid state drive (SSD; even less noise and faster startup time). The minimum hardware specs are modest: I’ve built LX521 implementations on a Shuttle XS35v2, a Zotac zbox, and even a Raspberry Pi. For the audio interface you’ll need a sound card with at least 6 output channels. Any card capable of 5.1 or 7.1 surround sound will suffice. It’s best if the card supports a sample rate of 44.1kHz (the standard for CD audio) since re-sampling to anything else takes a lot of extra cpu cycles to do properly. Make sure the card has a S/PDIF input if you want to use that as your audio source. I’ve had success with a Diamond Xtreme 7.1 usb, a Creative XFi Surround 5.1 usb, and the built-in Intel AC97 audio codec in my desktop PC. Alternatively one can send the crossover outputs over hdmi, which supports up to 8 digital channels. In this case you’ll need an additional device for multi-channel digital-to-analog conversion: in my own LX521 setup I run the hdmi from my Zotac zbox to an hdmi audio de-embedder, whose analog outputs go to an AT6012 amplifier. You need to have linux installed. Any distro should work, but for a standalone “embedded” unit as pictured above you’ll want a minimalist install that doesn’t run an X server. I use Ubuntu server edition because it’s what I know and it’s easy to install. Make sure the ALSA sound drivers and utilities are installed: sudo apt-get install alsa alsa-base alsa-utils alsa-tools libasound2-plugins should work on any Debian-based distro (e.g. Ubuntu). The main tool we’ll use for running the DSP is ecasound, so make sure it’s installed (sudo apt-get install ecasound). Download and install rt-plugins, a collection of IIR digital filters (implemented as LADSPA plugins) that I wrote for doing loudspeaker xover/eq. You probably want additional plugins from the Computer Music Toolkit (sudo apt-get install cmt). Steve Harris’s plugins collection also has some useful filters (sudo apt-get install swh-plugins). Here card 2, named Device, is the 7.1 channel usb interface that I’ll use in the examples. Take note of the device name of the card you want to use. Run alsamixer and unmute the front, surround, and center/LFE channels on your sound card, and set their levels to 100% (0dB). (replacing Device with the device name for your sound card). For 4-channel output use -c 4. Depending on your hardware you may need to experiment with different pcm names and/or analog outputs to get this working. The mapping of software to hardware channels can vary between devices; try all the output jacks so you know which ones have a signal on them. (replacing surround51:Device with the pcm and device names you determined above). This will play a continuous loop of a 6-channel voice recording of “…left woofer … right woofer … left mid … right mid … left tweeter … right tweeter…” identifying each output channel by name. Take note of which label plays on which analog output, since the same channel assignment is used in the 3-way crossover implementation below. For a 2-way crossover you’ll need only 4 output channels, in which case download chan_labels_4.wav and run the following command instead. This plays a loop of “…left woofer … right woofer … left tweeter … right tweeter…” Again, take note of which hardware outputs the various labels appear on. This takes input from the (stereo) audio file mysong.mp3, applies the crossover and other filters, and outputs the resulting 4-channel, 16-bit raw PCM directly to the sound card. The woofer L/R outputs appear on channels 1 & 2; the tweeter L/R outputs are on channels 3 & 4 (the test you ran above will help determine which physical outputs these correspond to). Various aspects of this command can be changed to handle specific use cases: e.g. you can change the input and output bit-depth or sample rate (provided your hardware is compatible) or you might want to process audio from a digital or analog hardware input instead of an audio file. Changing the -o:alsa,... to -o:myoutput.wav will send the 4-channel output to a file instead, which can be useful for testing. Update (14/09/2015): Q: What does the -x in the ecasound command do? A: Nothing. But I leave it there for when I want to redirect the audio output to a file for testing. The -x tells ecasound to truncate the output file (if it already exists) before writing. If you never use file output then you can safely leave this out. The files pre.ecp, tweeter.ecp and woofer.ecp define the actual filter chains using ecasound syntax (see the man page). Each chain can have any number of filters, of any type, limited only by the filters available as LADSPA plugins or built into ecasound. Here the “pre” chain contains only one filter: a -8.5dB notch at 82Hz with Q=2.6 (e.g. to suppress a room mode). The “woofer” chain consists of a Linkwitz-Riley 4th-order low-pass at 1500Hz, followed by a shelving filter with a gain of 4dB at low frequencies, centered at 150Hz, Q=0.71. The “tweeter” chain consists of a Linkwitz-Riley high-pass at 1500Hz, a 1.9ms delay (for phase/time alignment of drivers) and 4.5dB of attenuation (to match driver sensitivities). This takes input from mysong.mp3 and outputs 6-channel, 16-bit raw PCM to the sound card, with the woofer L/R output on channels 1 & 2, mid on 3 & 4, and tweeter on 5 & 6. The files pre1.ecp, pre2.ecp, woofer.ecp, mid.ecp and tweeter.ecp define the corresponding filter chains, just as in the 2-way crossover example above. The signal path within ecasound is 32-bit floating point. This provides practically unlimited headroom, so clipping between filter stages is not a concern. Only at the final output stage do samples get clipped to the interval [-1.0,1.0]. The easiest way to adjust overall gain to prevent clipping at the output is to put a level adjustment in the “pre1” filter chain; e.g. putting -eadb:-6.0 in pre1.ecp will reduce the overall gain by 6dB, on all channels. To process an analog line-level input, simply change the -i:mysong.mp3 in the examples above to -i:alsa,hw:Device (or whatever ALSA device name corresponds to your hardware). Use alsamixer to ensure the “line” input is unmuted and set as the default capture device. Inspect output.wav for evidence of clipping, adjust the input gain and/or your analog output, and repeat until the digital recording is just shy of clipping. To process a digital stereo S/PDIF input, simply change the -i:mysong.mp3 in the examples above to -i:alsa,iec958:Device (or whatever ALSA pcm corresponds to the S/PDIF input on your hardware). Use alsamixer to ensure the S/PDIF input is enabled. warning: your S/PDIF hardware probably expects a 16-bit/44.1kHz input, the ecasound default (if not, you need to precede the first -i: with a suitable -f: switch to specify the format of the digital input stream). In any case, you must ensure the output sample rate of your digital source will always match the specified input sample rate. Mismatching sample rates at the S/PDIF interface could result in outputting digital noise at high output volume — which could be disastrous to your loudspeaker drivers and/or ears. The Squeezebox Touch, for example, will output 96kHz if the source material has this sample rate: don’t do this unless your S/PDIF input supports it and you’ve configured ecasound appropriately; instead, you should configure squeezeboxserver to force re-sampling everything to 44.1kHz, or just use the analog outs. I’m working on a more elegant solution to this problem. If your PC has hdmi out, this offers an attractive way to get the crossover outputs out of the PC in digital form: hdmi supports up to 8 channels of raw uncompressed PCM at 24-bit resolution. A separate device is then needed to convert all channels to analog: an hdmi audio de-embedder is one option; or use an hdmi receiver, which adds the convenience of down-stream volume control. update (20/6/2016): I’ve found a major problem with hdmi output to an Atlona HD570 “audio de-embedder”. When driven with signals above -15dBFS this combo can generate subsonic distortion that pushes the LX521 drivers past their excursion limits, with ensuing unpleasant noise and/or damage to the drivers. I don’t know the cause yet, or even whether the problem is in the pc or the Atlona device. Please use caution, and see this post if you’re considering this approach. This creates an mpd output that pipes 32-bit stereo PCM to ecasound, which then applies the crossover and sends all 4 output channels to the soundcard. For this to work you’ll need to build mpd from source with --enable-pipe-output. The reason we pass data in 32-bit is to avoid adding the quantization noise that would result if mpd truncated its output to 16 bits after applying its volume control. Some have expressed concern that the mpd config above re-samples everything to 44.1kHz, preventing “bit perfect” playback of hi-res audio files. Unfortunately mpd’s pipe plugin outputs raw (headerless) pcm data: currently there is no provision for passing the stream format variables (sampling frequency, bit depth) to ecasound so that it knows how to interpret the raw data. The easy solution is to hammer the data into one fixed format before passing it to ecasound. My current soundcard only does 44.1kHz so that’s a good choice for me; if you prefer to re-sample to 96kHz (and have a compatible soundcard) you just need to change every occurence of 44100 to 96000 in the mpd config above. Alternatively, it should be possible to avoid re-sampling by having mpd output directly to a virtual alsa device (instead of piping to ecasound) defined via a custom asound.conf that sets up the xover/eq ladspa filters. Others have worked on this approach (see e.g. this thread) but I haven’t tried it myself. Personally I view hi-res formats and the pursuit of “bit perfect” playback as distractions from the real issues in audio quality (everyone should read Monty’s excellent 24/192 article). Provided you have enough cpu power to use the best quality sample rate conversion in real time, the resampling will be acoustically transparent. In the case of hardware (analog or digital) input you probably want the DSP to start running immediately on boot. You just need to put the appropriate ecasound command line in your /etc/rc.local or similar. To prevent unpleasant pops and thumps when powering the PC on or off, first mute all input and output channels and store the ALSA mixer settings where they will be loaded on boot (doing alsactl store should work). Then put appropriate amixer commands in /etc/rc.local so the outputs you want get unmuted only after the system has booted. Running the DSP in software introduces a small latency (on the order of 100ms) in the audio stream, which might be noticeable when starting, stopping or switching audio tracks. This can be minimized by reducing the buffer size that ecasound uses. I find that adding -z:nodb -b:256 to the ecasound command makes the latency imperceptible on my system. Clicks and pops in the output are probably a sign of buffer under/overruns, which can usually be fixed by increasing the buffer size, e.g. with -b:1024. To adjust the left/right balance for a particular crossover output (e.g. to correct for variability in driver sensitivity, like the Pluto ASP does) you can use the ecasound syntax -eadb:gain,channel. E.g. to boost the signal to the right-hand tweeter by 0.8dB you would put -eadb:0.8,2 in tweeter.ecp . All of my audio sources (a Logitech Squeezebox and an mpd server) are actually small linux PCs. So I figured why not use that cpu for digital signal processing as well? The squeezebox lacks both the cpu power and multi-channel output, but integrating a crossover into mpd turns out to be easy. In terms of audio quality, software DSP has no benefits over more specialized hardware (e.g. 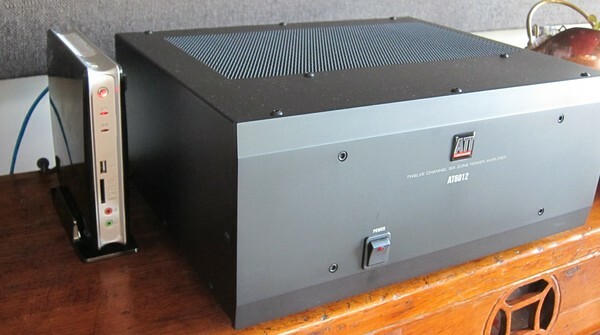 the miniDSP or Behringer DCX2496). But computers do enjoy enormous economies of scale (witness the $25 Raspberry Pi) so a software approach can be less costly. Computers will keep getting smaller and cheaper, whereas hardware DSP units will likely never benefit from such economies of scale. One can integrate it with a media server (e.g. mpd) within a single device, which could be used for other things as well. It makes available a larger palette of filters and algorithms. I can write my own to provide anything that’s missing, and I can be certain of what the filters are actually doing. It’s much easier to program: with a laptop I can do this from the listening position. Through an ssh connection to the PC running the DSP one can, from the listening position, switch between alternative xover/eq configurations on the fly. This makes level-matched listening tests/comparisons much easier and more reliable to set up and carry out. Because the software and configuration are open-source, others can take what I’ve done and make it better. I’ve been trying to replicate your configuration with Ubuntu Server 13.04 (AMD64) and an ALC662-based sound card, but I only get sound out of four of the six sound card outputs. I’ve searched several forums to no avail. Would you mind letting us know which version of Ubuntu you are running, and if you are using anything other than the standard kernel and version of Alsa? I’m using Ubuntu Server 12.04 (i386), with the stock kernel and ALSA. When testing 6 channels out, make sure you put “-f:16,6,44100” on ecasound’s output. Also, on some sound cards I’ve only been able to get 6 channels out if I send the output to the Surround71 PCM — presumably some quirk in how ALSA maps the output channels. Hope this helps! I have put together a Linux box running AVLinux with a Delta 1010LT. I have managed to get through the speaker tests and have identified the outputs. What I want to do is a three-way active crossover with the bass going to a mono subwoofer, the mids going to a stereo amp and the tweeters going to another stereo amp. How do you suggest I resolve the stereo signal for the bass signal to mono? This is off the top of my head; I haven’t tested it. It puts the mid outputs on ch 1/2, tweeters on ch 3/4 and sub on ch 5. The sub channels are attenuated by 50% (-ea:50) before summing, since summing doubles the amplitude if L/R inputs are in phase. Wow. Thanks! I will give that a try. Still trying to understand how all this works. I will study more before I burden you with questions. Thanks for the reply. I have installed ecasound, rt-plugins and the other ones mentioned above. When I run the code included above (after editing for my soundcard name) and or any other code on this page in terminal I get all kinds of errors that either state unrecognized format or unchained setup and similar. Maybe I am not supposed to run the ecasound commands solely in terminal. The article above is admittedly a bit above my head. I am going through the ecasound manual but am flummoxed. So I do not wear out my welcome here do you have a recommended tutorial so I can better educate myself? It is exciting that I can get six channels of audio out of my card and if I can get this next part figured out I should have pretty cool setup. Success! Sort of. I used the three-way crossover in the main page and changed the parameters to reflect my system. Namely, I needed to change -o:alsa to -o:jack_alsa and then it worked. Now, I just need to adjust the crossover points in the woofer.ecp, mid.ecp and tweeter.ecp files. I want the woofer at 150, the mids as a bandpass 150-3500 and tweeter at 3500 and above. I realized that since I have a dual-coil subwoofer I do not need to sum it down to mono. For the life of me, I have looked for the .ecp files using find / -name *.ecp and cannot find them. I will keep looking. Glad to hear you’re getting somewhere with this! Alsa output fails on your system because your distro runs JACK, which blocks access to the sound system via alsa. You need to write the *.ecp files yourself following the templates above. I tend to keep them in /etc but they can live anywhere. If you get stuck, feel free to ask here and I’ll do my best though I can’t guarantee a quick response. Thanks again. The little graph you made clicked for me. I was able to connect what you were saying by seeing what you put in the topology layout. I think I have it right now. I hope I typed it in right because it sounds really good to me now. The phase fix helped a great deal once I heard the difference. I love the open-baffle sound much more than boxed speakers. I am very pleased. This whole effort has been good for my kids too – the old man can still learn things see? Thanks for your generosity and the gift of your time. Thanks for being so helpful: It is no wonder that you were endorsed by Siegried Linkwitz. I have created my .ecp files as .txt files and wonder if I am getting the syntax right? As to the pre.ecp I do not need a notch at this time so it is essentially blank. I am not able to figure out the syntax for the mid bandpass so it is a best guess. If you have time can you comment? I will put all these in /etc and point to them. *(I may end up using an open-baffle sub and will need to add some boost). Thanks again, if this is too much please tell me to pound sand and leave you alone. Syntax looks ok at a glance. Since pre.ecp isn’t needed you can delete it and the reference to it in your ecasound command. Well, it works at testing. I used the setup after making the edits for the bandpass per your suggestion above. I am not sure how to move the 150Hz highpass into the pre2 section but will figure that out. I am sure there is a phase problem at the moment per your thoughts above. It is tri-amped now with a stereo amp on each of the subwoofer (a dual coil), the mid speakers and the tweeters. Much adjustment is still needed but it works! The biggest change is I know have 300 watts running to the sub whereas before I only had 60. Got it running off of my IPad with apple lossless files to a MCM Line level converter that converts the -10dB to +4dB out to the inputs on the M-Audio 1010LT which has professional +4 inputs. Got some work to do. If you were near me I would buy you a beer! Probably two! Well, it sounds pretty good to me. I had to make some adjustments to the level of the line it – was a tad bit hot. Here is the ecasound command I am using. I am quite sure it is inelegant but it sounds good so far. Much better than the passive crossovers I was using before. The formatting of comment here does not look like it looks in the terminal. Correction: I just put the mid in pre2 and removed it from below. where the pre chain contains a high-pass to match the woofer’s low-pass; this affects both mid & tweeter, ensuring they remain in-phase. Maybe one day we’ll share a beer. Meanwhile, enjoy! I think it has something to do with missing sse on Arm CPUs. That’s right, arm doesn’t have SSE instructions. I fixed this in version 0.0.2, which will build on the Pi if you also edit the Makefile and remove the “-march=native” from CFLAGS — that option doesn’t work on the Pi, I have no idea why. I’ll fix this in the next release. Hi, I cant get cmake.. to work on my pi, can you help,please? Thank you for sharing your project with us. Do you know how much latency you have in your setup? For normal audio playback this does not matter, but if i connect e.g. my guitar to the analog input this matters very much. Did you test a lot on RaspberryPi? How much stereo ways can you achieve on this tiny cpu? I’m not sure about latency. Ecasound runs in real-time mode, so perhaps tens of milliseconds, but that’s just a guess. I don’t have my system fully functional on the Pi: the Pi has a usb bottleneck that prevents using a digital/analog input at the same time as multi-channel output, at least on the usb soundcards I’ve tried. The latest firmware has improved things, to the point where I can play audio from files on disk, but not from a digital or analog input. Hello, Have things improved for USB with the PI 2 to your knowledge? Is there are workaround to get multichannel output along with analog input? AFAIK the Pi2 suffers the same problems with usb bottlenecks. But omxplayer should now be able to do multi-channel out via hdmi; I think you could just pipe the audio from ecasound via stdout. This would leave the usb bandwidth free to handle analog input. I’ve been meaning to try this but haven’t found time. The ecasound command does work separately. any advice you can add, I’d truly appreciate. Don’t put line breaks within the “command” line (line 13) — mpd doesn’t like this. Just put the whole quoted ecasound command in one long line. Thank you! The other problem I had was not having all the pieces installed when compiling MPD. I can now see all my music, and as “me”, it attempts to play. Ecasound works as root, but not as me. Permission problem, I think. I’ll get it. Made major progress. I’m now able to get sound from an MPD client, but . . . The crossover doesn’t seem to be working. I get full range from the “tweeter” output, and nothing from any of the other ports. When tested with the command-line ecasound, all works fine, and I’ve identified which should be active. Checking with LADSPA, it does indeed have these plugins available. Ecasound isn’t crashing with core anymore, but. .. The command line with -x:mixmode,sum isn’t producing any output at all. It also crashes with core when the input file ends. It’s definitely not your plugins, but I’m just not able to get the command line right. Finally figured it out. when you do the -o with the -f:16:4:44100 and send it to “surround51”, my sound card says, “I’m a 6 channel sound card, 4 channels is ‘out of range'”. I find that if I send 6 channels, then it’s happy, or if I send to “surround4.0” it is happy. Hopefully, this will help somebody else. The results sound better than my home-built analog crossover, done from the 1970s Linkwitz article. Glad to hear it worked out! Troubleshooting sound under linux is always a bit of a workout. Every sound card is a bit different. Replaced the AMD pc with my old Toshiba Pentium III laptop. Yes, I really mean a Pentium 3. It’s running fine, and it’s a lot quieter than the fan-filled PC. 30% cpu use on average, and it’s not logging any underruns. I’m very very happy with the results! I’ve managed to (politely) purloin a number of small PCs (eepc, revo and a Tranquil media pc) from our junk box at work. I’m busily installing Debian and hugely excited to get this all underway. Your solution is something that I desperately hunted for four or five years ago before I started attempting to make my own ASP based on Linkwitz designs. The problem is that they’re still all in bits in boxes and will likely never need to get finished now! Thanks in advance, Dan. Once again, I’m so grateful for your incredible work in this area! You mentioned you’ve implemented the xo using a Raspberry Pi. I’d like to use my existing avr via hdmi before investing in more sophisticated xo and amp. Did you get multichannel hdmi output working from the pi? What image did you start from? I did get a xo running on a Pi. The cpu can handle the processing in real-time; unfortunately the usb bottleneck on the Pi prevents getting 4- or 6-channel out to the soundcard without stuttering. I see that recent versions of omxplayer have enabled multichannel audio over hdmi, so you should be able to pipe 4- or 6-channel pcm through that, but I haven’t pursued it myself. I have a question: If I feed ecasound trough mpd with 16bits audio instead 32 bits, will quality suffer? No, 16 bits should be plenty. If (as I do) you use mpd’s software volume control, it will introduce some noise/distortion due to re-quantization. It’s measurable, but with 16 bit data the distortion products are about -96dBFS hence inaudible under most listening conditions. As insurance against this I try to keep the data path at 24 bits or more, but in practice I doubt that it matters. Yes, my plugins could be used directly within alsa without having to go through ecasound. In your asoundrc you would create a virtual soundcard device, whose job it is to route the audio through the various ladspa plugins and then to the appropriate hardware channels. This would be pretty neat: any software that wants to output audio could just interface with this virtual device. It’s been on my to-do list for a while. I just haven’t felt like learning the asoundrc syntax, which looks to be fragile and hard to debug. Let me know if you get something working! Very interesting! I’ve been working on digital crossovers for DIY speakers for several years. My current system, built about 2 years ago, is a Linux box with four 3 GHz cpu cores, an RME digital sound card, and RME A/D-D/A box (RME ADI-8 DS) with 8 channels in/out, a couple of ATI 4 channel amps (AT1800) and a couple of Phoenix-like panels and W-frame woofers. I wrote all the software myself in C++ except for some utilities (jackd, fftw3). My digital filters are 8192 tap FIR filters; there are 8 filters (3 for each speaker system and 2 for ambient sound channels, at present unused). The system sampling rate is 88.2 kHz. I’m using the convolution theorem (hence the need for fftw3) to reduce the time complexity of running the filters to O n*log(n), so the computer is actually just loafing along (using about 25% of one core) at this sample rate. To generate the filters, I measured the speakers out-of-doors in a large parking lot, and fitted curves to the data, then inverted the driver impulse responses within their operating ranges to get the filter coefficients. It is actually more complicated than that, but that’s a subject for another comment. I’m currently building a couple of digital crossovers for my Pluto speakers based on the Beaglebone. I have a Beaglebone controlling a cs4271 codec on a breadboard via alsa and jackd, and I have my software mostly written. My intent is to run the system at 176.4 kHz, but that may turn out to be more than the Beaglebone can handle. Currently my 44.1-to-176.4 kHz upsampling code and two channels of digital filter code are using up about 80% of the available cycles, but I’m not done optimizing. I really need to leave a fair amount of headroom on the CPU, maybe 40%, to be sure of not ever missing a sample. Unfortunately the available Linux kernels for Beaglebone do not yet include a real-time version. I’m also in the process of learning how to make PCBs using the gEDA free software package. I agree. I picked up a couple of bbone black units a few months ago, but got distracted by other projects so they’ve just been sitting around. The cs4271 is a stereo codec… did you use 2 of them for your stereo 2-way xover? And how did you connect the cs4271 to the bbone? Not knowing how, I’ve been forced to use usb-audio which has its limitations. My idea is to have a crossover per physical speaker system, e.g., for the Pluto, there’d be two Beaglebone/codec/power amp boxes as the two bases. This keeps the wiring short between the codec and the power amp and cuts down on the Beaglebone compute workload. I made it work straight away (took a couple of hours) on my Cubitruck & Debian Wheezy and an RME UCX. No major issues. The two channel crossover is just generating 6% load. Not too bad. How about 1st order and higher order (32db/48db) filters?? I used to use a Behringer DCX2496. It allowed to go for 32/48db filters. Is it possible to stack 4h order filters ?? a single cap today. Would be nice to have that filter option in the rt-plugins. 2. How do you handle different samplerates with mpd?? 1. First-order filters are on my todo list. I haven’t needed them and probably won’t, but I’ll put them in next time I look at the code. As for higher order filters, I probably won’t bother: you can build them up by chaining together first- and second-order filters. E.g. an LR4 filter is two identical 2nd-order filters (Q=1/sqrt(2)) chained toghether. Putting two LR4 filters back-to-back will give you a simple 48dB/oct filter. 2. I’ve configured my mpd.conf to output everything as 24-bit/44.1kHz (resampled as necessary). You could do 24/96 if you care and your cpu can keep up. Use the “samplerate_converter” tag to choose among several resampling algorithms to balance quality against cpu power. The best is “Best Sinc Interpolator” but it’s cpu-intensive so might cause stuttering on weak hardware that can’t keep up. For me “Medium Sinc Interpolator” sounds indistinguishable, and it runs fine in real time on all the hardware I’ve tried it on. I am running ubuntu 14.04 on asus motherboard with amd opteron 4-core processor nvida graphics card. No physical space limitations. Since your original post would you have more up to date suggestions for sound cards. I am running a 5.1 system but eventually the main speakers will be bi-amped (Audio Artistry CBT36K Line Array Speaker). Current running Carver original amazing speakers as mains. I am looking to eventually replace my surround sound preamp (emotiva umc-200) with computer solution mostly due to bi-amp requirement for CBT36K speakers (I don’t wish to add an extra stage of ADC-DAC to system to implement required digital crossover). PS: What math are you interested in. I develop symbolic computer algebra software (sympy/galgebra) for geometric (Clifford) algebra. I haven’t tried any new sound cards lately and probably won’t. In my own setup I don’t use a sound card per se: I output 6ch digital audio via hdmi (this needs the closed-source nvidia driver, at least the last time I checked; the open-source “nouveau” driver couldn’t take multi-channel pcm). The hdmi goes to an outboard 6ch dac, then the ATI amp. My math has been mainly dynamical systems, but applied math generally. Lately I’ve gotten into design algorithms for DSP, using best approximation in the L1 norm. I’ve been using maxima for symbolic work. Are you running ubuntu 32 or 64 bits (some sound cards seem to care). What are you using for your dac. Since I have a surround sound preamp (umc-200) with digital input (hdmi from computer) should I use that for my dac (forget about using it for dts/dolby decoding and equalization) instead of a sound card. If so how would I do dolby decoding (tivo optical output) of streaming signal from tivo on the computer (what software should I use). With regard to math. Are the ecasound filters implemented as recursive time domain filters? I’m running ubuntu 32-bit. I think. It takes hdmi in and outputs up to 8-ch analog. Indeed, you could just as well use a surround sound preamp, provided it knows how to receive 6-ch pcm audio over hdmi. If you want dolby decoding that will have to be done in software prior to the xover/eq, though I don’t know how. In this application you definitely don’t want your preamp to apply any processing! Thank for the information on the atlona dac. I will initially try to use a asus xonar d2 sound card (also has spdif input and ouput) which appears to have good alsa support. With regard to dolby/dts encoding it appears that both VLC and XBMC will decode the audio streams. What I need to figure out is how to decode the AC3 stream from my tivo’s spdif output on my computer. Separately have you used or have any opinion on the Faust DSP programming language. I’m aware of Faust but haven’t used it myself. For me it would be overkill: the DSP required for loudspeakers is pretty simple and all doable with bi-quads or bi-linear recursive filters. Sorry, I missed your question about the filter implementation. Yes, the filters I wrote are implemented in the time domain. They’re all 2nd-order recursive filters, i.e. “biquads”, derived from the transfer functions of their analog counterparts via a bilinear transform. I couldn’t find an existing implementation of everything I needed so I ended up rolling my own. But there’s nothing special about them. Have you looked at using the Xonar U7 7.1 USB sound card? I was tempted by that one. I’d be surprised if it could really do 192/24 over usb. In any case I wasn’t sure about linux driver support so I gave it miss. I intend to use it just for implementing this DSP crossover, using a BeagleBone Black. This is on Lubuntu 14.04, but Debian on BeagleBone works aswell. first I would like to thank you for your work you put into this tutorial. I have a question about routing the audio to the ecasound. Would it be possible to use a video player on a linux client (e.g. XMBC oder VLC) and direct the sound output of those to the ecasound for the dsp? Ecasound would be running on that client as well. Then use a soundcard or two soundcards to output the sound to the amplifiers? Then you just need to configure vlc/xbmc to send raw audio to mypipe.raw. You may need to tweak the ecasound command and/or your video player so they agree on the same sample format and rate. (eca-chainsetup) WARNING: Couldn’t lock all memory! (eca-chainsetup) Opened input “alsa”, mode “read”. Format: s16_le, channels 2, srate 44100, interleaved. (eca-chainsetup) NOTE: using existing audio parameters -f:f32_le,2,44100 for object ‘loop’ (tried to open with -f:s16_le,2,44100). (eca-chainsetup) Opened input “loop”, mode “read”. Format: f32_le, channels 2, srate 44100, interleaved (locked params). (eca-chainsetup) Opened output “loop”, mode “write”. Format: f32_le, channels 2, srate 44100, interleaved (locked params). (eca-chainsetup) Opened output “alsa”, mode “write”. Format: s16_le, channels 6, srate 44100, interleaved. Do you see anything obvious that I am doing wrong? Running the same Linux distro as you with a Zotac Nano PC and a Vantec USB 7.1 audio interface. I should note that this is passing audio through — either with the S/PDIF input or line input of the interface. But I would like to know why there are these locked params and what I can do about it. I’ve also tried SOX for dithering, but no matter what buffer I type in I always get a under-run. Thanks in advance. There are no errors here: ecasound is just being verbose about reporting what sample format it’s using to pass data between audio chains. If it really matters, you can probably prevent this by explicitly setting the audio format (i.e. -f:f32_le,2,44100 or -f:s16_le,6,44100 as appropriate) at the input and output of each chain. But I find it easier to just let ecasound use sensible defaults, since they end up being correct. Piping to sox for ditther gave me delays between the channels, and also some alsa buffe underrun problems, not anything you have encountered? Tried to change buffer sizes up and down for both ecasound and sox but did not manage to make it work. I’ve only encountered buffer underruns under heavy system load. What hardware are you running on? Late answer … But the system is a AMD athlon2 X4 2.9GHz with 6GB of RAM etc. Doing nothing else at the moment, and i dont see any extreme CPU usage. It’s disturbing that your outputs are out-of-sync. I wonder if this is caused by under-runs within alsa? What happens if you bypass the dither step? Thank you very much for developing these and posting them online. I have been starting to follow your very good examples. I wonder: have you or anyone else tried this on a raspberry pi 2? That may have enough horsepower to do the inputs, outputs, and dsp at the same time. Actually, even the RPi rev.B has the horsepower. I’ve checked myself: I was able to do realtime 6-ch dsp at 44kHz, at around 50% cpu load. The problem is with getting the output through the usb bottleneck: there is a longstanding bug in the RPi that causes usb packet loss under heavy load. I tried several workarounds but the result was always alsa underruns and choppy audio. I believe this limitation persists in the Pi 2 but haven’t tried. A good alternative is to send the audio over hdmi. AFAIK there is no alsa driver that can output 6-ch audio directly to hdmi on the Pi, but you could pipe the audio from ecasound to omxplayer, which does do multi-channel audio (a feature I requested for this purpose). I never followed up on this, but it should work. I was able to get surround51 working on my RP 2 going to a USB soundcard to a tri-amped setup but only as output. That is, only if the music was already on the PI 2 system. I have had a devil of a time getting the USB I/O figured out. The PI 2 routes both Ethernet and USB through one channel. I am likely to give up on the I/O part but it may be interesting to see if Clementine or similar loads well on the RP2 and use it for output only to a USB surround card. Anyone else have any luck? Or set up a named pipe (FIFO). Maybe someone who has omxplayer working can comment here? Any clue what that means? The only difference is a day of being unplugged. No idea. Not a real informative error message is it? Try running ecasound in debug mode (-d)? Great work. Is there any tutorial for using ecasound as a 5.1 channel equalizer? I am replacing my emotiva preamp and doing everything on the the computer (htpc ubuntu 14.04, kodi isengard 15.0 media center, xonar d2 soundcard) and I need to apply different bandpass filters to the front, center, back, and subwoofer speakers after the digital sound stream is output from kodi. Eventually I wish to replace my Carver Amazing speaker with the one shown below which would require bi-amplification and a dsp crossover. This assumes standard channel assignments with mains on ch.1/2, center on ch.3, sub on ch.4 and surrounds on ch.5/6. What’s going on here is all filter chains have 6 channels, but channels that don’t belong to a given collection of speakers are muted so they don’t contribute to the summed output. to put a parametric eq on the sub channel only (-6dB with Q=2.6 at 80Hz). Thanks for the CBT tip! I finally got around to reading all those papers. The theory on those is beautiful. I’ve been wanting to design a portable but high-quality mono unit for sound reinforcement (amplifying the digital piano in my band). This seems ideal. Will it be possible to omit the fixed sampling frequency in the filters? It could be nice, if the crossover was able to switch sf synchronously with the music files. As I have music stored in 44.1, 48, 88.2, 96, 176.4 and 192, in 16 and 24 bit, it would be nice to not having it resampled in the crossover. An other interesting thing could be to pipe output through I2S to 2-4 DAC-boards (one board for tweeters, mids, woofers etc.). I know the ESS9023-based boards often go for around 20-25 USD. That way one could make a seriously well performing xo with high-end level of sound quality. One approach is to run the xover/eq filters directly within alsa. i.e. write a custom .asoundrc to create a virtual multi-channel audio device that applies the ladpspa filters and sends the output to the right hardware channels. I haven’t tried this myself, both others have worked on it, see e.g. this post on diyaudio. If you needed more that 8 synchronized channels what would you use for a DAC on linux. The only ones I have found are the RME Hammerfall cards that allow you to increment 4 analog channels at a time. The RME cards are all I’ve heard of, but I haven’t looked recently. I just wanted to thank you for this tutorial! I have been using your crossover solution in my car since september 2013. Running on a small Atom/Ion laptop in the glove compartment, it does its job very well! Many thanks for this awesome tutorial! I have been successfully building a small system with a Wandboard, MPD and an Hypex amplifier following your good advice. I have to say that the ecasound part thanks to you as been the easiest part ! Thanks for the reply and the Richard Taylor link. Very interesting! Nice complement he gave me. Feel free to pass on the following to Richard. With these three papers I’ve written nine CBT papers in all since 2000! I’m a dedicated evangelist for the CBT array technology! You should be interested in the Time/Phase paper. I properly implemented CBT array will reproduce square waves at all locations (whatever that’s worth)! It’s essentially linear phase and time aligned at all locations. Look at the Power Point first; it will make the most sense. I am working on this setup with an Odroid C1+ and two different surround sound USB cards. The speaker test above for 6 channels works perfectly. However, when I try the test for ecasound using the 6 channel wave I only get the woofer and mid pairs and garbled sounds for the tweeters. It is the same for both cards. I checked the ecasoundrc file and do not see a conflict. Thoughts? Now, i need to figure out how to use mpd so I can load all the music on to my Odroid SD card. Is this a sane mpd command? Well, where to start? I am using a Jessie OS for the Odroid downloaded from the hardkernel.com site. I autoremoved pulseaudio. I installed ecasound and all relevant alsa parts. I have edited the mpd.conf per the command above including putting the ecasound command in one long line. The only audio_output I am using in the mpd.conf file is “pipe”. GMPC sees the music I downloaded into a file. It plays fine but it does not employ the crossover instructions. That is: I get six channels of audio through my USB SoundPro card but they are all full-spectrum. I checked my LADSPA_PATH and made sure it pointed to the ladspa files too. I get no errors at all and it actually works really smoothly. It just does not get crossed over. Could be a typo… you have “-a pe2,woofer” where you should have “-a:pre2,woofer”. Consequently the pre2 chain is taking its input from the wrong place. I thought I might add that I was unable to install mpd from source. I kept getting a dependency failure for libicu. I located and installed ICU and libicu-dev successfully but it kept hanging. I was at my limit for Linux skills already. The mpd.conf file had “pipe” in it already and it is the only output I am using. Perhaps I am wrong but my thought was if “pipe” was not enabled I would get no output. Is that wrong? Got it done. Running smooth on an Odroid C1+ through a Sewell SoundPro using MPD & GMPC. It has a three-way crossover and is tri-amped. Thanks for this website! Sounds good. I needed to recompile MPD from source. Glad you got it running! The “pipe” output is disabled in the mpd build on some distros. I gather that’s why you need to recompile? It was unclear whether it was enabled or not to me. The “pipe” command existed in the list of commented options in the mpd.conf file but it seemed like it was a generic mpd.conf. When I enabled pipe out in the existing file it did not work. So, I tried recompiling and then it did work. I especially like being able to tweak the crossover to get things just right for my ears. I have no testing equipment so I am just listening and making adjustments. Thanks again for sharing this with all of us. Just completed successfully building your filters on an “orange pi plus” to replace my old PC. Only problem I had was figuring out what I needed to install…. The build went flawlessly after installing gcc, build-essentials, cmake, cppcheck…. I am thinking that an Odroid and USB card like I have worked with would work to implement Linkwitz’s Pluto system. What do you think? Like a Poor Man’s Pluto? I am laughing because I just clicked the next link above and the page is about Pluto implementation. I had not seen that page before. I am going to have a go at it. Made a kernel change and got multichannel out over hdmi on the raspberry pi 2! I’m testing, so I only want one output at a time so I can map the channels, I ran “`speaker-test -c 8 -r 48000 -D hw:0,0 -t wav“` and that sends audio to every channel, as expected. What happens when I run the above code is that all the audio is running to the left front channel (channel 1). Any idea how I can get 8 channels working. I only need 6, but my right front channel isn’t working, so 8 channels would let me work around that. The next issue is that the audio is fairly distorted if I keep -b to high or too low. -b:2048 seems to be the best setting, but I can still hear the occasional dropout, what’s the best way to deal with that? I hear “left mid” come out of my Surround Back Right channel on the amp. I don’t get any audio out of the SBR channel . I can get sound out of SBR if I use -chorder:1,0,0,0,0,0,0,1, but that outputs sound to the front left and SBR channels. I also don’t hear any filtering on the audio even though I’m running through the woofer chain. Where do the woofer.ecp files live? but haven’t had any progress. I presume it’s just simple ignorance of how to set up a pipe in linux but could you please tell what I’m missing? Your ecasound command is correct, but not all audio players allow streaming pcm audio to stdout. Each has its own syntax, which should be documented in its man page. For vlc the appropriate command-line option is ‘–sout’. I don’t know if spotify or amarok can do this. Even if it can, know that the raw pcm data will be headerless, i.e. with no self-identifying info about sample rate or format, so you will need to make the format explicit in your ecacound command line. Thanks for that. What you’re suggesting makes sense and I’ll explore it. In the mean time I’ve found a solution that seems to work: Use Mopidy – a MPD variant that integrates easily with spotify and other streaming inputs as well as local sources with a good range of frontends. However this only uses Gstreamer output format so I couldn’t see how to make it use your MPD solution. Instead I installed Jack and used this to connect Mopidy to Ecasound with your active crossover. It seems a long way around but at the moment it’s working pretty well. The good thing is that I can use your LADSPA filters with Ecasound to tune everything just as I want and the frontend options to Mopidy give lots of flexibility to managing both streaming and local file sources. I’ve still to check it out fully but so far I’m happy. Thanks for your fantastic work and inspiration. I’m enjoying reading your other audio stuff. Glad you hear you sorted it out! You should be able to set ecasound to read raw pcm from that file, thus eliminating your gstreamer/Jack routing, if you want to do that. Are a genius! Great Writeup! thank you for this tutorial. It is exactly what I was looking for my Raspberry Pi for a very long time. I tested it on a Raspberry Pi 2, 3 and zero with soundcards/dacs from HifiBerry and Pimoroni PhatDAC. Works fine. BUT: Until now I just was able to playback a mp3 file to test my settings. Now I really like to output music played by Squeezelite on my Pi. I would be really happy if you could help me out on that. Run squeezelite with “-o -” on the command line to pipe output to stdout. Then run ecasound with “-i:stdin”. You probably also need to explicitly tell squeezelite what sample rate / bit depth to output (the man page describes how) and configure ecasound’s input format (with “-f:,,”) to match. Alright – thanks for the hint. I will try that and report, if it worked. For about 1000 Times until I stop via ctrl+c. I did not change any rat/bit depth in squeezelite. I get the same message when squeezelite ist NOT running and I start ecasound. It looks like squeezelite isn’t sending data to stdout, so ecasound isn’t able to read anything. Make sure squeezelite is playing music before you run ecasound? as there is a hifiberry DAC attached. I bet it’s something very small. Parameter. Setting. I don’t know. But I hope you’ve got some ideas I can test. I really want to make it work. ??’??.é?0_?????????????j???S???M???i????ä???g???s???????????Ü???7???G??????????????e???S???J???X???????????????????$??8ä?<c? Ä? v? D???????????? ?????e??E??????T??S.??=??é??V??&????????????K??H??)!$????1????????????????????? ?#&2 ????????????,??#?????????????????????? ?? ??S?I?"·???????????????├???? Compile perfectly with slackware 14.2 on a banana pi pro device. What a great tutorial! I have successfully implemented the x-over. I have 2-way x-over implemented in ecasound for LX mini. Although everything is working properly, but i do have an annoying issue. The problem i have is drifting (not sure if this is the right term). What i mean is, if i restart ecasound, and start watching a movie. The audio and video are in sync. But 2h later, the audio is a little bit delayed (just few ms). But in few days, the delay is getting bigger, like few seconds. Until now i have no idea how to fix this. Do you maybe know what is causing this? That’s strange, and I’m not sure what’s causing or how to tackle it… with audio and video handled by different processes, there might not be a way to keep them in sync. Disclaimer: I know nothing about audio :P.
Why not simply use ecasound’s -efh and -efl parameters as resp. high- and low-pass filters? What’s the benefit of using those rt-plugin filters? One could certainly use the built-in -efh/-efl. But the documentation doesn’t specify the order (1st? 2nd?) or critical frequency (is it the -3dB point? -6dB?) so it’s hard to know exactly what these filters are doing. A 2nd-order low- or high-pass with specified Q value is a common (and standard) building block in signal processing. Since ecasound doesn’t have such a thing built in, I wrote my own. 1/. When I place in the line command like “-el:RTlr4lowpass,3500” it works. BUT when I try to create *.ecp file consist inside this command (let’s say low.ecp) and put this command in line instead of -el:RTlr4lowpass,3500 filter doesn’t work (actually it passes all frequences). I cant figure out what am I doing wrong. Where should I put *.ecp file? I already try directory where filters are as well as home directory. Doesnt work. The second reason could be I did something wrong in creation the ecp file. Could you please give me example of properly written ecp file and clear where it should be placed in therms of catalogues? This is intended to run loop fake sound card during boot. How should I add to this file which describe filter chain (let’s say filter.sh) to run it automatically on boot? For now I handled it at this way that i make file filter.sh run in startup programs as program (-e gnome-terminal /path/filter.sh) but it open terminal each time I boot and to keep filter working I need to keep terminal open which is extremely annoying. 2. On some systems I put my ecasound filter chain directly in rc.local, just before the “exit 0”. Run ecasound in the background by terminating the command with “&”. I’ve sometimes found it helpful to add commands to mute the audio before running ecasound and to unmute it after. Let me know and I’ll post my rc.local here if you like. Two years ago this page revolutionised my sound set up! As noted above, I wanted to route streaming music (as well as local files) to Richard’s ecasound digital Xover. The best I managed was to use mopidy which has spotify and youtube as well as local file backends feeding via gstreamer to jack which has an output that ecasound can read. This has worked well even though it’s a bit roundabout, but recently mopidy has been having trouble with changes in the spotify protocol which means that I haven’t been able to load playlists which is pretty frustrating. Best to also get it to run killall jackd after Shutdown to keep things clean, if you wish. So now all audio gets automatically fed to ecasound as soon as jack is loaded and then to my Linkwitz Pluto+subwoofer (variants). Best computer monitors I’ve heard! Thanks for very clear and informative explanations. I came to your HOWTO after getting a Gradient (sub)woofer for my beloved QUAD Els 63. The seller had not keep the crossovers but his price was right for the subs alone. Difficult to read because I had to put it on a single line to start the MPD server. My server seems not to accept opening ‘ ” ‘ without closing it on the same line. My setup works (plays tracks from my library through MPD), but does not xover, I get the same sound on both hw,1,0 and hw,2,0 (which is not the case when using ecasound directly). I run MPD 0.20.18 under Ubuntu 18.04 (bionic). 2) mpd running in an environment without the LADSPA_PATH environment variable set, and so unable to find the ladspa filters, in which case you might need to preface your ecasound command with e.g. “export LADSPA_PATH=/usr/local/lib/ladspa; …” or wherever your ladspa filters are installed. In either of these scenarios ecasound is likely to just blunder on and output the unfiltered audio. It was the LADSPA_PATH missing that caused my problem. I am a newbie with signal processing. Would you happen to know of a filter that could provide a 6db/octave boost to compensate for the cancellation of the dipole woofer? Glad to know you were able to solve your problem! As for filters to compensate for dipole rolloff, there are at least a couple options discussed by Siegfried Linkwitz. He shows electronic circuits, but all can be implemented in digital by chaining one or more of the standard biquad filters. I typically use a shelving filter to boost low frequencies while leaving high frequencies at unity gain (you will need to experiment with values for the center frequency, gain and Q-factor to achieve the target 6dB/oct slope in the frequency band where you want it). You might also want a shallow notch to level the peak that occurs where the response stops rising (where path lengths for radiation from front and rear differ by a half-wavelength). this is an amazing guide, thanks for the work. Have you figured out a solution for digital input (in my case over spdif)? As long as the digital input has the right sample rate everthing works flawlessly. However when the signal is lost (source device powered down or optical cable unplugged) I of course get the loud digital noise. Is it possible to detect when the input stream is incorrect or missing? Then one could trigger a script to use a different ecasound command with for example analog input. Currently I use a small external dac to convert the digital input to an analog input signal for the pc where the filters are implemented. I was just wondering whether it is possible to eliminate this in theory unnecessary DA and AD conversion. Thanks; glad to know people still find this useful! And no – I haven’t figured out how to gracefully handle errors/dropouts in a digital input stream. That issue (in addition to the problem of unknown sample rate and resolution) makes it difficult to handle digital input from unknown or varying sources. Your idea of wrapping the ecasound command in a trigger script is certainly one solution, but this issue is probably best dealt with in hardware. Your extra DA/AD stages are actually a decent solution: likely less error-prone than any script I could write, and if they’re implemented well then any degradation of the signal should be negligible.